The year is 1928 in Gyeong-seong (modern-day Seoul), Korea. Young Kim Jun-shik (Shin Sang-yeob), his father (Chun Ho-jin) and sister Eun-soo (Lee Yeon-hee) work on the farm of the Hasegawa family (Shiro Sano, Kumi Nakamura) in Japanese-occupied Korea. Both Jun-shik and young Tatsuo Hasegawa (Sung Yoo-bin) are interested in running; by the time they are teenagers (Do Ji-han, Yukichi Kobayashi), they have become fierce competitors. Tatsuo's grandfather (Isao Natsuyagi) is killed in a bomb attack by a Korean freedom fighter, and subsequently a Korean runner, Sohn Kee-chung (Yoon Hee-won), wins a marathon race against Japanese competitors, further inflaming Korean-Japanese tensions. In May 1938, Jun-shik (Jang Dong-gun) is working as a rickshaw runner. Koreans have been banned from taking part in sports events and Tatsuo (Joe Odagiri), now a fierce Japanese nationalist, has sworn that a Korean will never again win a race. Though he has been accepted by a medical college in Berlin, Tatsuo decides to stay in Korea to run in the All Japan Trials for the marathon. Sohn secretly backs Jun-shik and the latter wins the race, though Tatsuo is awarded the medal when Jun-shik is disqualified for allegedly cheating; a riot by Korean spectators ensues. As punishment, those who started the riot are forcibly drafted into the Japanese army, including Jun-shik and his friend Lee Jong-dae (Kim In-kwon), who has a crush on Eun-soo. In July 1939, they find themselves, along with 100 other Koreans, in the battle at Nomonhan, on the Mongolianborder, where a Chinese sniper, Shirai (Fan Bingbing), avenging the death of her family at the hands of the Japanese, is captured and tortured. Tatsuo, now a colonel, arrives and takes command, forcing the existing commander (who is far fairer to the Koreans), Takakura (高倉; Shingo Tsurumi), to commit seppuku. After refusing to join a suicide squad organized by Tatsuo to fight the Soviets, Jun-shik is imprisoned with Shirai but escapes with her, Jong-dae and two other friends to the River Khalkhin. Jun-shik, seeing the tanks on the horizon, attempts to return to base to warn the Japanese forces. During his return, he is attacked by a Soviet I-16 Ishak, and is saved by Shirai, who dies after shooting down the plane. Jun-shik returns to the base and manages to warn the Japanese forces that a large-scale Soviet tank attack is coming, but Tatsuo refuses to order a retreat. During the one-sided battle, a tank shell explodes near Tatsuo and Jun-shik, knocking them unconscious. In February 1940, Jun-shik and Tatsuo end up in Kungursk POW camp, north of Perm, in the Soviet Union, where both Koreans and Japanese are incarcerated together. Under the name of Anton, Jong-dae has become a work-unit leader and helps his Korean friends, while abusing the Japanese, though it becomes clear that Jong-dae's ultimate allegiance now lies with the USSR. Jun-shik humiliates Tatsuo in a sanctioned fight to the death, but then Jun-shik suddenly refuses to kill Tatsuo, and both get punished together. Later, a work accident incites a riot, which nearly led to an execution by firing squad of Tatsuo and Jun-shik, when news comes that Germany has declared war on the Soviet Union. The Soviets immediately conscript the POWs, shooting those who refuse or were too slow to don the Red Army uniform. Jong-dae volunteers Jun-shik and Tatsuo — still tied to the stakes — into the Red Army, saving their lives. They all fight in a bloody battle against the German army at Dedovsk in December 1941. 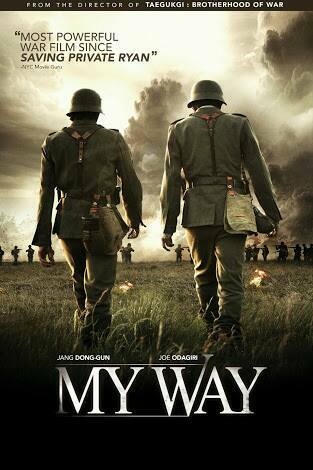 Jong-dae dies while leading the Soviets to battle, but Tatsuo and Jun-shik manage to survive. Jun-shik convinces Tatsuo to don German military apparel taken from bodies and trek over the mountains into German territory. As they travel, it becomes clear that Tatsuo has been injured. They come upon an abandoned town where Jun-shik goes out to find medicine to give to Tatsuo. During his search, Jun-shik is found by German soldiers, who, unable to understand him, capture him. Meanwhile, the dying Tatsuo is found by soldiers searching the house he was placed in. Three years later, Tatsuo is part of the German Army. He finds himself on the beaches of Normandy, France, just prior to the D-Day Allied invasion. As the army fortifies the beaches, Tatsuo sees a man running on the beach. He catches up to him and sees that it is Jun-shik. It is apparent that they have not seen each other since their capture by the Germans. They decide to run away from Normandy to catch a ship in Cherbourg rumored to safely sail out of theater, and ultimately return home to Korea. As they attempt to leave, the Normandy Landingsbegin. Jun-shik and Tatsuo are locked into a machine gun pillbox by a German officer. The two force open the door and emerge to a scene of chaos, with American soldiers overrunning the beach. They run inland, but Jun-shik is wounded by a bomb fragment in the chest, and bleeds profusely. Noticing American paratroopers approaching, a dying Jun-shik forcibly replaces Tatsuo's identification tags with his own; telling Tatsuo that "He is now Jun-shik". Otherwise, since Tatsuo is Japanese and considered a sworn enemy of the Americans, he could be killed on the spot. Soon afterwards, Jun-Shik dies and Tatsuo cries aloud as the Americans close in.